Soon after I arrived in Australia on 15 June, 1979, I took a job as a Boiler Maker. Shortly after that I heard an ad on the radio for Control Data Institute. I fell in love with the idea right away and quickly enrolled. 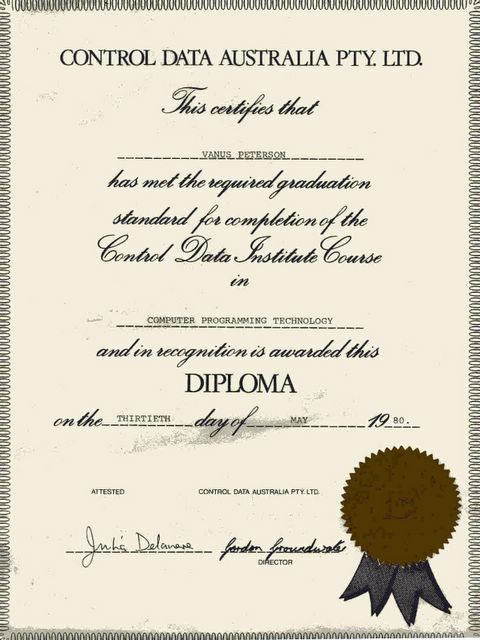 Upon graduated, I was offered a COBOL programming job at American Express in Sydney. I really enjoyed working there. I had an interest in computers, beginning while I was aboard U.S.S. Alamo where I built a Sinclair Scientific calculator from a kit, but I didn't really know a programming language until I attended the six month course at CDI. I took eight months to complete the course because I wanted to get my AU $3,700 worth.